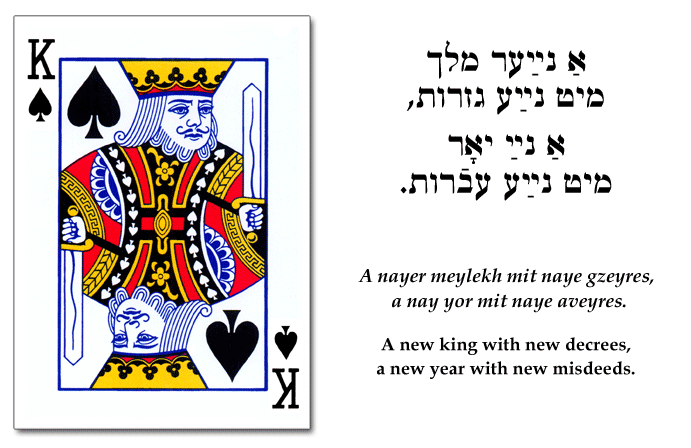 Yiddish Wit: A new king with new decrees, a new year with new misdeeds. אַ נײַער מלך מיט נײַע גזרות, אַ נײַ יאָר מיט נײַע עבֿרות. A nayer meylekh mit naye gzeyres, a nay yor mit naye aveyres. A new king with new decrees, a new year with new misdeeds. Never pray for a new king.